The restaurant was beautifully decorated with Christmas streamers and a tree and there was a lovely fire making the room so welcoming. Imtiaz and his staff greeted us and we sat at our table ordered drinks and started to decide on what we were to eat. There was a 3-course menu followed by mince pies, chocolate mints, coffee and brandy/liqueur. I think we could all feel the weight going on before we even started! We made our choice of starters and main course and sat back to survey everyone thoroughly enjoying themselves on this festive occasion. 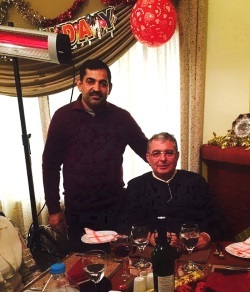 We hadn’t realised until the following day when Intiaz shared some photographs that Al Shaheen had a special guest on Christmas Day – Interior Minister Kütlü Evren and his family. After we arrived there were still people arriving and the restaurant became very full which gave a lovely atmosphere. Our starters arrived – paté, broccoli and stilton soup and prawn cocktail – lovely. Then the main course of turkey with all the trimmings and a good selection of vegetables. We waited for a while before ordering a dessert and by this time the tempo in the restaurant was increasing and we were surrounded by the sounds of the giant party poppers going off with showers of glittering confetti floating everywhere. There would certainly be a lot of clearing up later for the staff. There were some familiar local faces at some of the tables so we were able to have a chat with a few of them during the afternoon. By the time we had finished our meal we were well and truly full and the mince pies were wrapped up to take home, we just couldn’t manage any more. Imtiaz and his staff never stopped for a minute, they all worked so efficiently and always with a smile. Thank you for yet another very enjoyable Christmas Day. 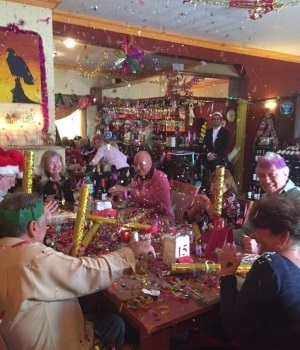 This entry was posted in Special Events and tagged Al Shaheen Restaurant Karakum, Christmas Day at Al Shaheen, Christmas in North Cyprus, Kutlu Evren, North Cyprus, TRNC by kyreniacatkin. Bookmark the permalink.